You can’t be what you can’t see. So said the civil rights campaigner Marian Wright Edelman many years ago talking about the need for more diverse role models in our society and the media. And we also need a mirror to see ourselves. 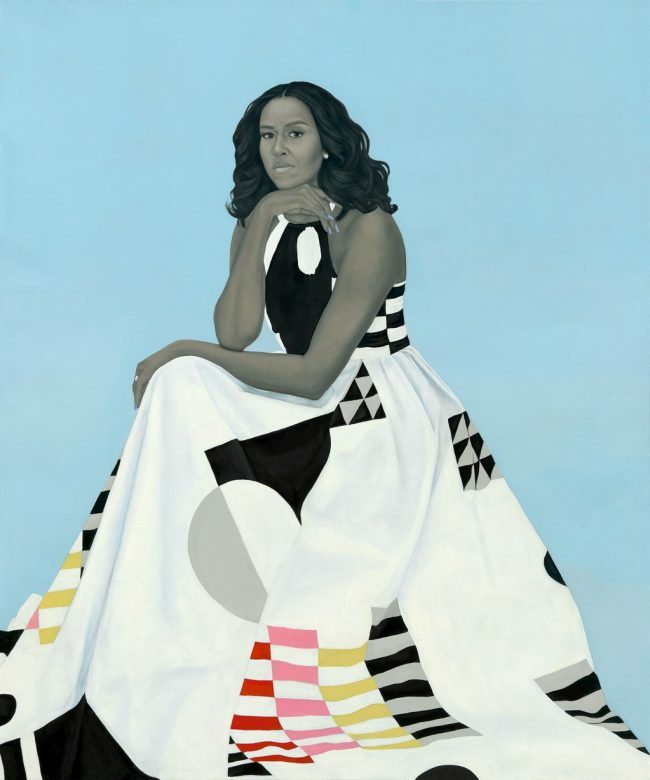 So said Zoe Whitely yesterday, speaking at The Story conference about a powerful new portrait of Michelle Obama by Amy Sherald (below) and the impact it will surely have to inspire other little black girls in the future. The importance of mirrors was the explicit and implicit theme of most of the wonderful talks from the Story conference yesterday, now in it’s 9th year, which is lovingly curated by Matt Locke and the team at Storythings. Another hugely engaging speaker and role model at the event was Juno Dawson talking about her career of becoming a writer of non-fiction via fiction and teaching, whilst transitioning from a gay man just 5 years ago. She has repeatedly looked in the mirror and boldly decided to change. Whilst we all need to see ourselves reflected throughout society, mirrors don’t always project our internal perceptions. Mandy Rose shared her story of short 2 minute films broadcast on the BBC including an older gentleman who remarked “inside you don’t don’t get any older but every time I look in the mirror I don’t recognise what I see”. Lisa-Maria Neudert spoke about one eastern european teenager who earned $16,000 for one ‘junk news’ video on youtube last year that attracted a lot of views by mirroring the fears and anxieties of the US electorate. Remarkably she claimed that 50% of the media consumed in the run up to the election was in fact ‘computational propaganda’. Tania Byrne gave a personal and inspiring insight that who you are and where you are are not the same thing. Growing up in Britain with a Ghanaian mother and Irish (largely absent) father she never felt enough of either. She talked about feeling ‘unfinished’ which mirrored my own experience (and I’m sure many others too) of having immigrant parents from different countries. Pioneer music producer Elijah had tried to please his mum and dad and get a ‘proper’ job. But when no such jobs were forthcoming when he graduated around the 2008 financial crisis, he and his friends had the ultimate freedom of creating a new genre of music that had very few established traditions. Sometimes putting the mirror down can be liberating too. All of these talks reinforced for me that the battle of our times is whether we want a society and economy that is open verses one that is closed. It goes without saying that we passionately advocate openness and therefore more than ever it’s important to celebrate the pioneers that others can aspire towards. Yet we also need to be wary of hall of mirrors and echo chambers of exaggerated opinions and reputations. So if we want to change the world, then we need to look into the mirror. But then put it down and listen to the stories of somebody you don’t know. In doing so lies an awesome web of associations when combined with your own stories within which lies unlimited opportunity.